This monument in Centennial Park, in the Town of Altona, commemorates Mennonite settlers who arrived in this region in 1875. Originating from the steppes of South Russia, 6,000 Mennonites arrived here over the course of a decade and began farming in seventeen townships reserved for them by the Canadian federal government, known as the Mennonite West Reserve. Seventy villages were founded and the land was laid out in the open-field system by dividing the land around each village into long strips. This was an inefficient system for grain farming and, by 1924, the open-field pattern and many villages were abandoned. 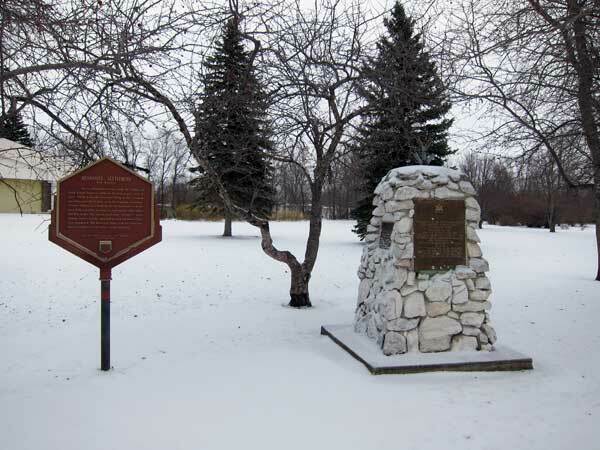 The monument was placed here by the Historic Sites Advisory Board of Manitoba. Beside the monument is a cairn, erected in 1967 by the Town of Altona and Rural Municipality of Rhineland, to commemorate the centenary of Canadian Confederation. A plaque on its side was added at the 25th anniversary of the Altona Centennial Park and commemorating the ten people who served on the original board. The cairn was erected on 28 July 1967.